Built to last with waterproof qualities. Quality-tested prior to end delivery. Sizes: 8 x 5m, 8 x 6m, 10 x 5m, 10 x 6m, 12 x 5m, 12 x 6m, 14 x 5m, 14 x 6m, 16 x 5m, 16 x 6m. Our exclusive, custom star tents offer a top quality and sturdy alternative to canopy tents for the UK and worldwide markets. 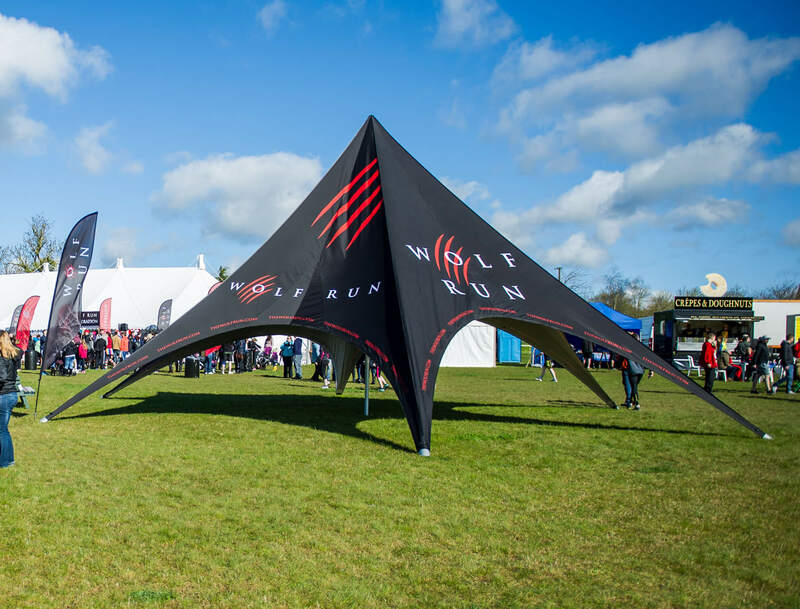 Our range of radial star tents offer a distinctive and eye-catching promotional feature at your event. Our photo quality print process is second to none, ensuring your custom star tent stands out and represent your event perfectly. Unlike our competitors, all of our custom star tents are erected at their final stage of the manufacture process to ensure they function flawlessly. Digitally printed in any design using any combination of colours, these bespoke star tents are manufactured using 500d Polyester PVC coated fabric which is waterproof, fire retardant and offers UV protection. Our custom star tents are available in a variety of sizes and heights. We also offer a range of double-peak star tents, which are large enough to seat up to 128 people. The sturdy telescopic central pole ensures the star shade tent is easily erected and dismantled. The custom star tent is also compact when put away in the carry bag for travel. The radial custom star tent comes complete with carry bag and all ground pegs and accessories are provided, including the ground peg extractor. Star tents are suitable for soil and/or sand surfaces. If it’s quality and service you’re after for your event items (including canopy tents, pop up banners and pull up banners), get in touch today. Call us today on 01905 425324, fill in the online form at the top of our website or email sales@scimitarsports.com and we’ll get back to you within 12 working hours. WHY SCIMITAR FOR CUSTOM STAR TENTS? Specialists in event canopies and tents. Pantone perfect matching for corporate guidelines.